The middle-aged guy riddled with bullets in an alley just off Wabada. The 58-year-old man slumped in a puddle of blood inside an apartment on Wren. The 32-year-old who had been watching a street fight on Minnesota shot in the face at point-blank range. The 57-year-old man crumpled in the middle of St, Ferdinand, shot repeatedly. The “John Doe” shot dead in an alley parallel to North Broadway. The Mexico City firm that tracks murders in every city on earth with a population over 50 thousand concludes that, based on killings per 100 thousand residents, St. Louis has the 13thhighest murder rate on planet Earth, roughly the same as Culiacan, Mexico, which happens to be the headquarters of the Sinaloa drug cartel. 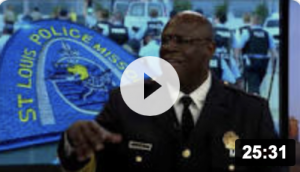 Police Chief John Hayden says the Gateway City resembles Dodge City mainly because rural, white, conservative lawmakers in Jefferson City have passed some of the nation’s most lax gun laws. And he points to a surveillance video cops released last year of two guys with AK-47-style assault rifles waving them around in a parking lot at Grand and Broadway. The Second Amendment Bubba Brigade in Jeff City doesn’t care how many (mostly black) St. Louisans are shot and killed every year. Despite their law-n-order yawping, they don’t seem bothered that the tsunami of guns are both leading to more violent crime and endangering cops. They’re, instead, married to the idea that every Missourian has the right to carry an assault weapon with a 30-round magazine in public just in case, you know, Bambi stages an uprising out in the woods somewhere. They also conveniently ignore facts, such as new figures from the Centers for Disease Control and Prevention showing Missouri has the sixth highest gun death rate in the country. 1,307 Missourians were killed by gunshots in 2017, a rate of 21.3 corpses for every 100,000 people in the state. That’s almost twice the national average. And, like flat-earthers convinced they’ll sail off the edge of the earth if they travel far enough, they’re also sure than more guns equal less crime, even though common experience and over 30 different scientific studies show just the opposite is true. Take the 2015 study from Boston Children’s Hospital and Harvard that shows firearm assaults are around seven times more likely in states with loose gun laws than in states with gun controls. Or the 2003 study in the Annals of Emergency Medicine that shows people who have guns in their homes have a 44 percent higher chance of killing someone else, and a 244 percent higher chance of committing suicide by gun than non-gun households. If the Jeff City gun nuts are unwilling to pay any attention to evidence or the body count, there’s a slim chance they’ll listen to a cop, but that isn’t stopping Chief Hayden from trying. He told me that he’d like to see two sets of gun laws in the state—one for rural Missouri, and one for urban areas like St. Louis or K.C. Right now, there are two primary sources for the guns that are terrorizing neighborhoods from the Ville to Carondolet. The first is theft. Because so many more people have guns in their homes and cars now, burglars are looking for firearms as much as cash or jewelry. The second source is what are called “straw purchases”—people who buy guns legally, then re-sell them at a significant mark-up on the streets. And now, the GOP super-majority in Jeff City has an even brighter idea: make it legal to carry concealed weapons on mass transit. The thought of turning buses and Metrolink into free-fire zones, or stopping cops from arresting someone on mass transit with a gun, either doesn’t matter, or never crossed lawmaker’s minds. So few brains? Look no farther than your state capitol.